Kendrick Kang-Joh Jeong (born July 13, 1969) is an American comedian, actor and physician. He is best known for playing Ben Chang on the sitcom Community and the gangster Leslie Chow in The Hangover film series. He was the lead in the ABC sitcom Dr. Ken, in which he was also the creator, writer, and executive producer. Jeong is a licensed physician, but has stopped practicing in favor of his acting career. He currently appears as a panelist on the singing competition show The Masked Singer. Jeong was born in Detroit to South Korean immigrants. Jeong was raised in Greensboro, North Carolina, and attended Walter Hines Page High School, where he took part in the Quiz Bowl team, played violin in the orchestra, and was elected to student council. He also played football in the 10th, 11th, and 12th grades where he won the state 4a championship. He graduated at 16 and his achievements earned him Greensboro's Youth of the Month award. Jeong graduated from Duke University in 1990 and obtained his M.D. at the UNC School of Medicine in 1995. He completed his residency in internal medicine at the Ochsner Baptist Medical Center in New Orleans, Louisiana. Kendrick Kang-Joh Jeong (born July 13, 1969) is an American comedian, actor and physician. 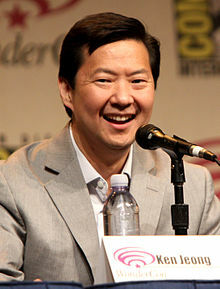 He is best known for playing Ben Chang on the sitcom Community and the gangster Leslie Chow in The Hangover film series. He was the lead in the ABC sitcom Dr. Ken, in which he was also the creator, writer, and executive producer. Jeong is a licensed physician, but has stopped practicing in favor of his acting career. He currently appears as a panelist on the singing competition show The Masked Singer. Jeong was born in Detroit to South Korean immigrants. Jeong was raised in Greensboro, North Carolina, and attended Walter Hines Page High School, where he took part in the Quiz Bowl team, played violin in the orchestra, and was elected to student council. He also played football in the 10th, 11th, and 12th grades where he won the state 4a championship. He graduated at 16 and his achievements earned him Greensboro's Youth of the Month award. Jeong graduated from Duke University in 1990 and obtained his M.D. at the UNC School of Medicine in 1995. He completed his residency in internal medicine at the Ochsner Baptist Medical Center in New Orleans, Louisiana. Jeong completed his internal medicine residency at Ochsner Medical Center in New Orleans while developing his stand-up comedy. Jeong is a licensed physician in California, but no longer practices medicine, having given it up in favor of his acting career. Jeong won the Big Easy Laff-Off in 1995, of which NBC president Brandon Tartikoff and The Improv founder Budd Friedman were judges, and they both urged Jeong to move to Los Angeles. He began performing regularly at the Improv and Laugh Factory comedy clubs. After moving to Los Angeles, he initially practiced medicine for several years as a physician at a Kaiser Permanente hospital in Woodland Hills. Jeong's background in theater and improv started while he was still a medical student in North Carolina. He was a regular at open mic nights in the Raleigh-Durham circuit, performing at Charlie Goodnights in Raleigh and Tootie's Durham Comedy Club. He also emceed The Comedy Spot programming series on Duke University campus 1992 and 1993 (produced by his friend by coincidentally same-first named Korean-American, Kendrick Jahng) opening for Margaret Cho, Jeff Dunham and others. His stand up work has led to several television appearances, including NBC's The Office, HBO's Entourage and Curb Your Enthusiasm. He made his film debut in Judd Apatow's Knocked Up as Dr. Kuni, which proved to be his breakout performance. From that point forward he was able to transition from medicine into a full-time career in the entertainment industry. Subsequently, he has appeared in Pineapple Express; Role Models as King Argotron; All About Steve; The Goods: Live Hard, Sell Hard; Couples Retreat; and as Mr. Chow in The Hangover, The Hangover Part II, and The Hangover Part III. He co-starred in Zookeeper and Transformers: Dark of the Moon, released in summer 2011. Jeong played Señor Ben Chang on the NBC sitcom Community and was nominated for the show's "Male Breakout Star" at the 2010 Teen Choice Awards. He was nominated for two 2010 MTV Movie Awards, winning the award for Best WTF Moment and for MTV Movie Award for Best Villain for The Hangover. In fall 2010, Adidas basketball began a wide-ranging marketing campaign in which he starred as "Slim Chin", alongside NBA stars Dwight Howard and Derrick Rose. On May 22, 2011, he hosted the 2011 Billboard Music Awards in Las Vegas on ABC and was featured in a Hands Only CPR PSA campaign from the American Heart Association on June 15, 2011. Jeong won a Streamy Award for "Best Guest Appearance" for Burning Love. In 2013, he appeared in Michael Bay's Pain & Gain (2013), as Johnny Wu, a motivational speaker, and returned, in a significantly expanded role, as Mr. Chow in The Hangover Part III. In an unusual, if informal, partnership, Jamie Foxx and Jeong have each agreed to star in movies written and produced by the other. Foxx has agreed to take a lead role in a new movie Jeong will produce called After Prom. Jeong will star in All-Star Weekend, a comedy Foxx is developing at his production company about two friends who find themselves fans of opposing NBA stars. In 2015, Jeong starred, wrote, and executive produced the pilot of his new ABC medical comedy, Dr. Ken, as a frustrated HMO doctor juggling his career, marriage and parenting, but succeeding at none of them. On May 7, 2015, the series was ordered by ABC to debut in the 2015–16 TV season starring Jeong, Suzy Nakamura, Dave Foley, Tisha Campbell-Martin and Jonathan Slavin. Jeong's first Netflix comedy special, You Complete Me, Ho, was released in 2019. Jeong's wife, Tran Ho, is Vietnamese American, a family physician and a breast cancer survivor. Jeong became engaged to Tran Ho around 2003 or 2004. They have twin daughters named Zooey and Alexa (born 2007). 2016 Ride Along 2 A.J. 1997 The Big Easy Dr. Tang Episode: "Night Music"
2001 The Downer Channel Store Owner Episode: "1.2"
2004 Significant Others Gynecologist Episode: "An Ache, a Fake & Forgot to Brake"
2004 Crossing Jordan Steve Choi Episode: "Slam Dunk"
2004 Grounded for Life Owner Episode: "I'm Looking Through You"
2005 Two and a Half Men Male Nurse Episode: "Woo-Hoo, a Hernia Exam!" 2005 The Office Bill Episode: "E-mail Surveillance"
2006 Three Strikes Roido's Interpreter Episode: "Pilot"
2006 Entourage Coffee Shop Manager Episode: "The Release"
2007 The Shield Skip Osaka Episode: "Back to One"
2007 Curb Your Enthusiasm Man in Jersey #1 Episode: "The Anonymous Donor"
2007 Boston Legal Coroner Myron Okubo Episode: "The Innocent Man"
2009 WWE Raw Host/Himself Episode: "3 August 2009"
2009 Men of a Certain Age Kuo Episode: "Pilot"
2010 Players Rufus Ramsey Episode: "Induction Day"
2012 Mary Shelley's Frankenhole Hyralius (voice) Episode: "Maly Sherrey's Hyralius, Mutant Monster!" 2013 Maron Himself Episode: "Sponsor"
2014 Hot in Cleveland Doctor Episode: "Stayin' Alive"
2015 Glee Pierce Pierce Episodes: "What the World Needs Now"
2015 Robot Chicken Richie Cunningham (voice) Episode: "Ants on a Hamburger"
2016 Wheel Of Fortune Dr. Ken Episode: "Fun and Fit 5"
2016 P. King Duckling Lee (voice) Episode: "A Day With A Panda"
2018 Drop the Mic Himself Episode: "Shaquille O'Neal vs. Ken Jeong / Jerry Springer vs. Ricki Lake"
2019 The Kids Are Alright Grover Young Episode: "The Love List"
↑ Barshad, Amos (May 23, 2011). "The Surprisingly Earnest Ken Jeong on the Secret Messages of The Hangover". Vulture.com. Nymag. Retrieved March 18, 2013. 1 2 "Medical Board of California - Licensing details for A 65869". dca.can.gov. ↑ Yorio, Nicole. 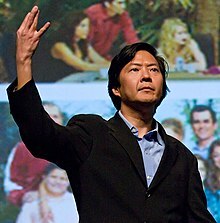 "A Side of Community's Ken Jeong You Haven't Seen". Redbook. 1 2 Lopez, Robert (June 19, 2009). "Greensboro native finds funny bone in movie". News & Record. Retrieved 2010-03-22. ↑ Lee, Chris (June 10, 2009). "Doctor provides best medicine". The Columbus Dispatch. Retrieved September 13, 2009. ↑ Ken Jeong (October 4, 2015). "Ken Jeong on Twitter: "@S0fak1ng83 born in Detroit, moved to NC when I was 4. My father got his PhD in Economics from Wayne State."". Retrieved August 31, 2016. ↑ Lee, Luaine (1 October 2015). "Ken Jeong was a doctor, and now he plays one on TV". Greensboro News & Record. Retrieved 15 December 2016. ↑ "Dr. Ken Jeong". Justforlaughs. Archived from the original on August 6, 2013. Retrieved July 18, 2013. ↑ "'Hangover' actor saw his career start in New Orleans -- at Ochsner". NOLA.com. Retrieved 2015-10-24. ↑ "Ken Jeong: How to Ditch Medicine for a Career in Comedy and Diagnose Castmates". August 27, 2015. Retrieved 8 September 2015. ↑ "Far*East Movement will perform at Ken Jeong-hosted Billboard Music Awards". Asia Pacific Arts. May 12, 2011. ↑ "Ken Jeong AHA Hands-Only CPR video". June 15, 2011. Retrieved July 18, 2013. ↑ "Nominations Are Announced For 3rd Annual Streamy Awards". The Streamy Awards. December 17, 2012. Retrieved July 18, 2013. ↑ Kit, Borys (April 5, 2012). "'Community' Star Ken Jeong Joins Michael Bay's 'Pain and Gain' (Exclusive)". The Hollywood Reporter. Retrieved July 18, 2013. ↑ Siegel, Tatiana; Belloni, Matthew (July 12, 2012). "Ken Jeong Signs on for Expanded Role in 'Hangover: Part III' (Exclusive)". The Hollywood Reporter. Retrieved September 7, 2012. ↑ "Jamie Foxx and Ken Jeong agree to trade movies". Los Angeles Times. 2012-10-10. Retrieved July 18, 2013. ↑ "ABC Orders Ken Jeong's Comedy 'Dr. Ken' to Series". May 8, 2015. Archived from the original on September 30, 2015. Retrieved September 8, 2015. ↑ "Medical Comedy Starring 'Community's' Ken Jeong Scores ABC Pilot Order". The Hollywood Reporter. 2015-02-10. Retrieved September 8, 2015. ↑ "Dr. Ken Series Premiere Date Announced". ABC Go. 2015-06-10. Archived from the original on September 4, 2015. Retrieved September 8, 2015. ↑ Jeong, Ken (May 7, 2011). "For My Wife, in Celebration of Mother's Day". Huffington Post. ↑ Deerwester, Jayme (September 3, 2009). "Ken Jeong transitions from doctor to in-demand jokester". USA Today. Archived from the original on 6 August 2013. Retrieved 18 July 2013. ↑ Margarita (June 7, 2010). "Dr. Ken Jeong Thanks Wife Dr. Tran Ho During MTV Movie Awards". Vitals. Retrieved July 19, 2013. ↑ "For My Wife, in Celebration of Mother's Day". The Huffington Post. 5 July 2011. Retrieved 25 September 2016. ↑ James, David (January 29, 2019). "A Surprising Cameo Has Been Confirmed For Avengers: Endgame". We Got This Covered. Retrieved January 29, 2019. ↑ "Teen Choice 2010 nominations". MTV. Retrieved 5 June 2016. 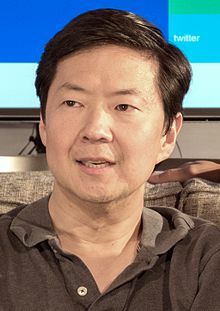 Wikimedia Commons has media related to Ken Jeong.